ORATORIO (AUS) (Bay 2001-Stud 2005). 4 wins-3 at 2, MVRC CS Hayes S., Gr.3. 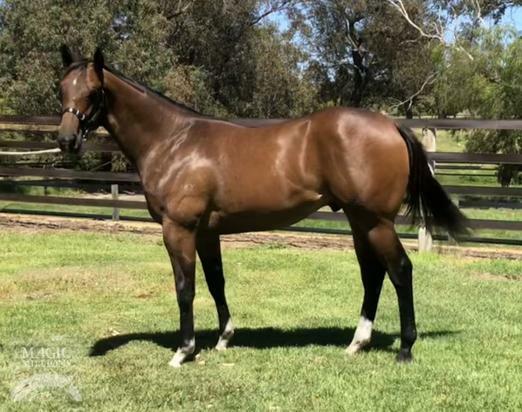 Sire of 394 rnrs, 234 wnrs, 15 SW, inc. Lucky Street (WATC Karrakatta P., Gr.2), Motion Pictures, Clueless Angel, Gold Rocks, Waratah's Secret, Private Dancer, Gold Busker, Rafaello, Cadenza, Mr Motown, Palace Intruder, Belora, Like an Eagle, Latoria, Trustee Brown, SP Dancing Express, Outlaw Pete, Moet Me, Shades of Rio, Passion Cantata, Colourful Charade, Indigo Ora, etc. DOYOUDARE (g. by Langfuhr). 8 wins from 1400m to 2200m, A$400,225, WATC Tattersall's Cup, L, Farewell Takeover Target H., Rogan Josh H., Amelia Park Welter H., Fishers Circle H., Dandaragan Organic Beef H., Marjoleo H., Starbaleta H., 2d WATC GA Towton Cup, L, Nui-Mara H., Shot of Thunder H., Ozone Reserve H., Century God H., Mr Kenneth George Williamson H., Ozbet.com.au H., Kalgoorlie City Football Club 2YO H., 3d WATC Strickland S., Gr.3, York S., L, Diggers' Cup, Afleetaffair 2YO H., Durham Lodge Stud 2YO H., Australia Day Cup H., John Hanlon H., Pink Metalskin Welter H., Graham John Pembrokeshire H., 4th WATC Belmont Guineas, L.
Jetoomy (g. by Reset). 7 wins from 1100m to 2100m, A$260,750, to 2017-18, WATC Gold Membership H., Rommel at Mogumber Park H., Crown Towers H., Get the Tabtouch H., James Boag's Premium H., Del Basso Smallgoods H., 2d WATC Dayana P., 3d WATC Belmont Classic, L, Auto Classic BMW H., Crown Perth H., Italo-Australian Welfare H.
Let's Go Lakers. 3 wins-1 at 2-at 1100m, 1800m, A$113,582, WATC World Plumbing Day Trophy H., 2d WATC Karrakatta Plate Raceday H., 3d WATC Westspeed Nursery H., Westspeed H.
Hussarik. 2 wins at 1950m, 2000m in Aust. Master Pearl. Winner at 1300m in 2017-18 in Aust. Rocky's Brother (g. by Tobougg). 4 wins at 1400m, 1600m, A$140,265, WATC RJ Priestman H., 2d WATC Skyracing.tv Provincial Championship Series Final H., Amelia Park Trophy, Perthracing.com.au H., Ascot Corporate Villas H., 3d WATC Tabtouch.mobi H., Perthracing.com.au H., Ozbet.com.au H., Argonaut H., Happy 35th Luke Rayner H., Tack on Track H., 1900 Bar H.
Black Carat (f. by Lonhro). 3 wins to 1100m, WATC Tabtouch.com.au H., 2d WATC PR Christmas in July H.
Imortalite (g. by Vital Equine). Winner at 1700m in 2017-18 in Aust. Bloomy's Sun (g. by Haradasun). Winner at 1400m in 2017-18 in Aust. Berni and the Jets (g. by Bernardini). Placed at 3 in Aust. Game Hunter. 5 wins from 1200m to 1700m, VRC Polo Prince H., 2d MVRC Meadow Hills Vegetable Marketing H., QTC Paint the Town Red H., 3d QTC Bill McGovern H.
Miss Evergreen. 4 wins-1 at 2-to 1200m, A$100,680, VRC Rainbird H., Long Tan H., MVRC Melbourne's GPO H., 3d MVRC City Pacific Finance Beaumaris H., MRC Danzero H.
Just Orm. 4 wins-1 at 2-to 1100m, A$210,900, to 2017-18, SCTC Yalumba 2YO H., BRC Magic Millions Life Changing H., Coolphase P., SCTC Yaroomba Beach H., 2d Toowoomba Plastics P., 3d BRC Hamilton Hotel 2YO H., Lunar New Year H., Mark Cotterell Jeweller H., Prive249 Restaurant P., 4th BRC Mick Dittman P., L.
THE OMEGA MAN (Northern Meteor). 7 wins to 1400m in Malaysia and Singapore, Perak TC Charity Cup, L, Singapore TC Kranji D S., Benchmark 53 H., 3d Singapore TC Kranji D S., Class 4 H.
MOTI (Don Eduardo). 8 wins to 1500m, A$313,800, AJC Toy Show H., L, Newcastle JC Tibbie S., L, Wyong RC Mona Lisa S., L, AJC Lake Moore H., Edensor Park H. Producer.